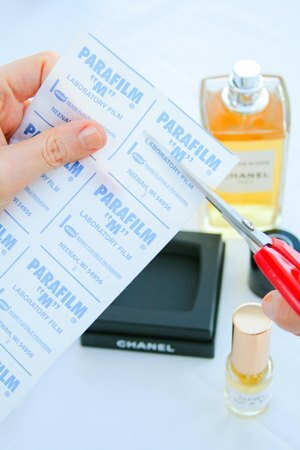 One of my first jobs at the perfume lab was nothing glamorous–I had to label blotters and make samples. Sticking hundreds of tiny labels on narrow strips of paper and filling out bottle after bottle was such a mind numbing task that I entertained the idea of creating a small robot and underwriting the expense. Eventually, I moved onto something more interesting, but ever since then I’ve become very good at making perfume samples. While not a resume worthy skill, it comes in handy from time to time. The seasoned perfume lovers among you have probably made hundreds of samples–congrats, you all qualify for a perfumer assistant position! On the other hand, those who are new to this hobby might wonder what on earth is a decant and how to get perfume out of a sealed spray bottle. I receive these questions on a regular basis, so when I recently had to make a perfume care package for a friend, I asked my husband to take some photos. 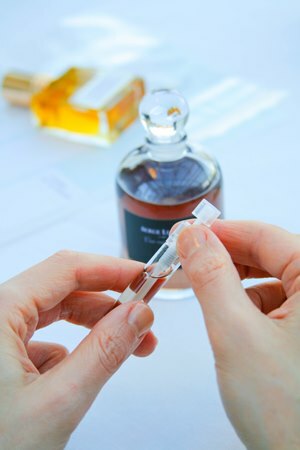 When perfume lovers talk about samples, they usually mean 1-3ml stoppered vials. 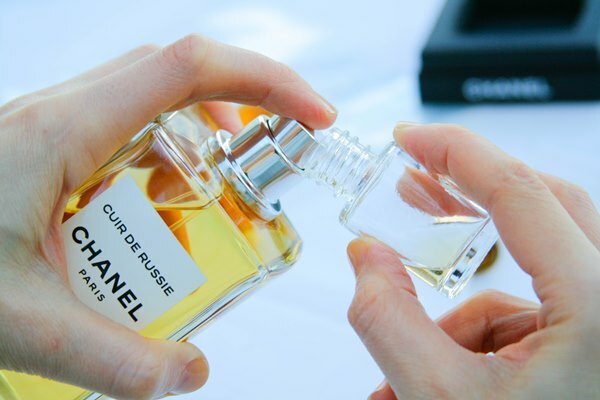 ‘Decant’ refers to a larger amount; it means that perfume has been transferred from its original container to a 5-30ml splash or spray bottle. Now, there is nothing particularly difficult about making samples and decants. 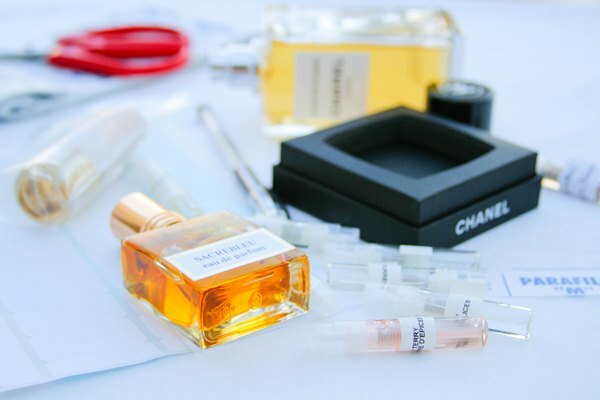 But if you’ve ever received a fragrant package full of empty vials from a decanting site or discovered that a perfume atomizer leaked in your purse, you know how frustrating it can be when a sample isn’t done correctly. If you are going to make samples and decants for yourself and friends on a regular basis, you will need: appropriate vials, plastic pipettes (useful for splash or extrait de parfum bottles), sticky labels, resealable ziplock bags (2″x2″ or 3″x5″ size), and parafilm tape. If you hate your hand writing or are impeccably organized, then you can invest in a portable label maker. When it comes to decanting from a spray bottle, many people wonder how they can remove the sprayer attachment. Well, in most cases, you can’t, and even if you could, I wouldn’t recommend it. It’s likely to have disastrous consequences. Just put the neck of the decant bottle or sample vial flush against the tiny spray opening, push the sprayer with conviction and that’s that. Some people like to use little funnels, but I find them a bother, because it’s hard to keep them clean. Vials have to be filled just enough and not too much, or else they will leak. Leave some head space in the bottle. 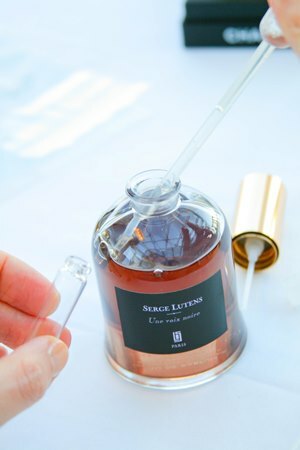 Thank you, Serge Lutens! 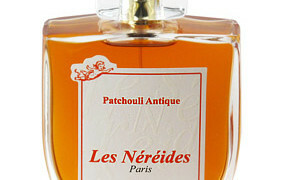 Making decants of your perfumes is very easy. I use disposable plastic pipettes for transferring perfume from splash bottles into spray or sample vials. Be sure that the lids of the 1ml sample vials are pressed in all the way. You should hear a satisfying click when it happens. Once you have filled your vials, you can label them. If you label empty vials and then starting filling them up, you risk smudging the ink. The final step is to seal the decant with parafilm. Parafilm is a plastic paraffin film that’s generally used in laboratories for sealing vessels. Think of it as a perfumista’s best friend. 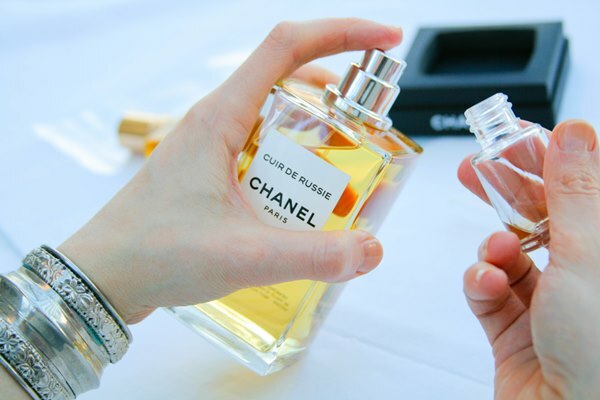 The malleable film protects perfume from evaporating, leaking or becoming contaminated. It’s a must for sealing bottles for storage or shipping. I wrap the tops of my bottles in parafilm to help my collection last longer. Parafilm leaves no residue or tacky marks on the glass, so it’s safe for most surfaces and is easy to remove. Tiny sample vials are best stored in ziplock baggies. Get the kind on which you can write. If you’re shipping decants, I recommend shipping each bottle in its individual bag. Even if something goes wrong and perfume leaks anyway, at least, the whole lot won’t get ruined. Lastly, don’t do a big decanting spree if you have your nails painted, since perfume will remove your polish within seconds. Where to buy decanting supplies in the US: there are numerous suppliers. I’ve had a good experience shopping at Accessories for Fragrance and Pilot Vials. For those who do decanting in industrial quantities, U-Line and Madina Online are good options. For the rest of us, the quantities and the cost of shipping are bound to overwhelm. Since many of you have mentioned SKS Bottle & Packaging in the comments, I want to add their website to the list: sks-bottle.com. Where to buy decanting supplies in Europe: When I asked Vanessa of Bonkers About Perfume where to buy decanting supplies in Europe, she mentioned Accessories for Fragrance in the USA as her top choice for small 1ml sample vials (contact them before placing an order to discuss customs fee, or rather how to avoid them). For the rest, she recommended Ebay. Several readers based outside of the US recommended Proudstyle.com to me, but I haven’t tried them yet. If you have any experience with this supplier, please let me know. If you would like a portable label maker, the Brother Personal Labeler Machine is a handy and inexpensive tool. Extra: Some more info (and cute cat photos!) can be found at Undina’s blog. This is far from an exhaustive list, and I would love to hear other sources for decanting supplies in your area. Also, please share your own tips on making samples and decants. Victoria: Thank you! I’ll let my husband know that his work was helpful. It’s one of those things that are much easier to explain in pictures than in words. In my perfumista life I’ve done hundrets of not thousands of decants and samples. As a student who wants to keep his costs as low as possible but who also wants to enjoy some fine fumes organizing splits and making decants from a bottle is a must. Lucas: That’s what I like about doing splits. That I can make others happy because they’ll have their own 10mls of a scent they like as much as I do. About shiping and leaking stopers- a nightmare really!-I once got a good tip from a perfumista friend : if the bottle is not sealed she decants the perfume into small brown apothecary bottles with a screw top before shiping.Ofcourse you lose a few ml but it’s better then massive leaking. Victoria: Thank you very much, this is very good to know! I use proudstyle.com for their little glass spray bottles, they are excellent and I have only had two leak so far. I think I overfilled them. Their 1ml & 2ml glass sample vials are good but the lids are poor, they only slide in perfectly once, then they are rubbish. Julia: I’m new to decanting so this post is invaluable. Thank you so much. Victoria: Very happy to hear this! Daisy: Super useful tutorial and information, Victoria! Daisy: Brilliant! It’s so funny that you say that because I happen to have some kimchi-scented butter in the fridge that I was just thinking I was going to dedicate to using for kimchi fried rice! Daisy: That sounds awesome! Kimchi and butter is such a good combo, so it butter and soy (that’s how I sometimes do steak). Also, have you had butter ramen? That is delicious too. Merete: Thank you for your wellwritten piece on this. 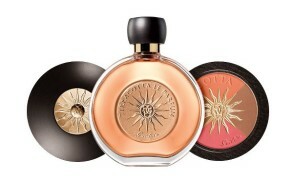 I always enjoy your writing on this blog, that I have followed for just over a year (since I got seriously absorbed in the heavenly world of perfumes). I have used and been satisfied with the 1,5 and 2,5ml spray bottles from Surrender to Chance. I live in EU, and they ship those small sizes over here. For larger decant bottles (10,15,20) I have used Proudstyle. They deliver worldwide, and their prices include international air mail delivery. The quality of the various types of their glass bottles I have tried is excellent. Vanessa: I have done a lot of swaps in my time, but I am always learning, and I think I need to investigate this wonder stuff that is parafilm, for a proper professional seal! Just using electrical tape can be tricky as it doesn’t seem to want to go round the neck of a bottle straight and develops kinks as you try to wrap it. Victoria: I swear I don’t own a stock in the company producing parafilm, but given how much I use it, I wish I did. kaori: Thank you for very useful tips. I will add the tape to my must buy lists. Undina: Thank you for the link, Victoria! I want to second the recommendation of SKS-Bottles (http://www.sks-bottle.com/340c/fin11e.html). casey23: I am a chemist and seeing you work your way around decanting, plastic pipettes and parafilms made me reminiscence! Oh how I missed my chem labs!!! Now I have an office job which is sooooo boring compared to this. leathermountain: You are both so very welcome. It is a bit of a thrill when some arcane bit of knowledge can be made useful to people who are doing interesting things! stina: It’s not just nail polish that you have to worry about with perfumes… I dropped a half-full glass decant on a polished hardwood floor not that long ago, and the alcohol stripped off the polish and left a funny star-shaped splotch on the hardwood. Time to go throw-rug shopping, I guess. Thanks for this post, Victoria! I’m relatively new to perfume and I’m just starting to think about decants and splits; and I also want to make sure that my few precious (and proudly chosen) FBs don’t evaporate into thin air! It’s great to have tips and info from the pros. leathermountain: Good point. Sometimes they even dribble down the side of the spray mechanism. I have a secondary perfume application there, swiping that little bit somewhere on my body or even clothes. Gentiana: Great, useful info and tutorial! I am seeking to find a perfume that smells as similar as possible to the scent moonlight path by bath and body works? Please any assistance or recommendations welcomed. Tammy Nixon: Thanks Victoria I will look into these fragrances.